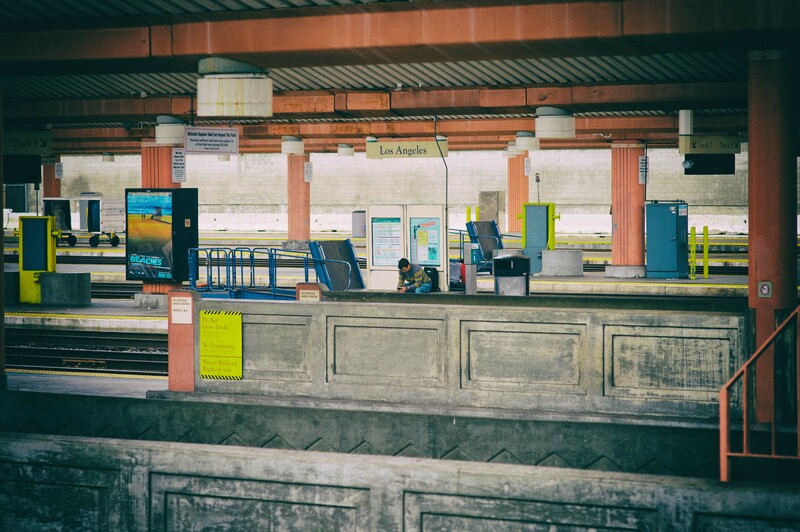 ART OF TRANSIT: Waiting for a train at Los Angeles Union Station on Monday. Photo by Steve Hymon/Metro. The chance of being convicted is so slim that “if you wanted to murder someone, it would almost be better to just hit them with your car,” said Assemblyman Mike Gatto (D-Los Angeles), who has pushed for stiffer hit-and-run penalties. Traffic investigators say that they are faced with thousands of hit-and-run collisions a year involving bikes, cars and pedestrians, and they must focus on cases with strong leads, such as eyewitness reports or the car’s license plate number, and on crashes that kill or maim the victims. “There are a lot of cases where we don’t have a lot to go on,” said Sgt. Daniel Dail, who works in the Sheriff’s Department’s traffic services detail. Scary stuff. The article also includes some excellent photography of victims by Jay L. Clendenin and graphics that show locations of accidents (which you can view by the year) and other trends. On a related note to cyclists: please be careful riding this time of year, especially with it getting dark in the midst of the evening commute. Use multiple lights and consider getting a construction yellow jacket to wear while riding. Or ask for lights/jacket as a holiday gift! Adding a general lane and HOV lane to the Golden State Freeway between the 605 and the Orange County border is proving, as expected, to be quite a chore. Hundreds of parcels had to be purchased and bridges demolished and rebuilt, not to mention the actual widening of this narrow section of road. People interviewed for the story agree it’s a needed project although some aren’t loving the traffic hassles that go with it. Metro, btw, is providing funding for the project. I don’t think the bullet train will ever be a replacement for the folks who use planes to make day trips around the state. But I think there are plenty of people who will use such a train even if it took five hours to get from L.A. to S.F. — a time which beats driving and could be passed enjoying the considerable scenery and contemplating how much more comfortable trains are than flying coach on any airplane. I mention the time element because the state is trying to adhere to a law requiring a bullet train that could make it between L.A. and S.F. in two hours and 40 minutes. That’s quite a task and has greatly raised the cost of the project, perhaps to the point in which it will take decades to ever accumulate the funds needed to build it. This editorial is in favor of new rules that would change the way that development and transit projects are studied in California. The traditional way is to see if a development or new transit project impacts traffic and, if so, to force the project to adopt mitigations to keep cars moving (usually in the form of adding lanes and/or turn lanes). It’s a particularly burdensome/ironic process for transit projects intended to provide an alternative to traffic. The editorial points out that new rules could exempt transit projects and the new rules would shift those mitigations more toward asking developers to provide things that would reduce the need to drive, such as charging for parking and/or providing transit passes to residents. The editorial also points out that many transit-oriented developments don’t really reduce car use that much and urges lawmakers to force those developments to pony up other things that may reduce the need to drive. Good point! My three cents: perhaps that could include things that would help with first/last mile connections to transit. Using Census Bureau journey to work results from household surveys conducted in the year 2000 and in 2012 the number of people using a bicycle as their main way of commuting to work increased 95%. Although commuting to work is only a portion of all trips, its a strong possibility that the growth in bicycle trips on streets has increased by a greater percentage than the hit-and-runs collisions involving bicycle riders. This would mean that there could be less odds of a bicycle rider getting into a hit-and-run collision in 2012 than in 2002. While commuting by bicycle is a healthy alternative to driving ones auto or even public transit it is my belief that there is a false sense of security is being used to promote this means of transportation. On most major streets in the Los Angeles are there is little room for bicycle riders to also occupy the number two traffic lane. Even with the most recent law being passed which provides more space between the bike rider and motor vehicles it’s still a scary environment being promoted. As a youngster I rode my bike from Silverlake to Hollywood almost everyday during the summer via Sunset/ Hollywood Bl. The biggest hazard was parked cars whose drivers would open their door in front of me. This is still a extreme hazard to both bike riders and yes buses. The majority of accidents with buses is the left front door on a parked vehicle being opened into the side of a bus behind it’s rear doors. While there is little damage to a bus the same cannot be said about a bike rider. Not only do they fall in many instances but the hazard of being ran over by a vehicle fallowing them. A glaring example was myself almost being ran over by a bus after striking a parked car opened door many years ago. While San Francisco provides bike lanes on Market St. for instance I’m sure those of us in Los Angeles would not tolerate the confusing and limited traffic lanes they have there. It’s my belief that parallel secondary streets be utilized as official bike routes. Not only would it be safer but also eliminate the present battle between the two modes of transportation which in some cases escalate to unsafe operation by both parties. Can we just build the bullet train already and quiet all the skeptics and set an example to the rest of the nation? Airlines have become more of a money hungry hassle and it not worth it anymore. Plus the trains will be more environmentally cleaner and reliable. Looks like Texas is going to build theirs first. Never thought that would happen. I agree, build the Bullet Train now not ten years from now. It could be fairly simple also. Just place the rails down the middle of the I-5 almost clear to Los Angeles. Bypass Palmdale, why detour a route for such a small percentage of riders. It makes as much sense as to fly to to San Francisco with a stop over in Palmdale. People are also getting fed with dealing with the TSA that only add to air travel frustration. That “30 minute” flight from LAX to SFO also includes getting to the airport, checking in luggage if you have any and clearing TSA checkpoints 2 hours prior to take off + time for boarding + cramming yourself in a sardine can with no legroom + waiting for pushback + taxi-ing to the runway, finally taking off, then 30 minutes in the air, then landing, taxi-ing to the gate, waiting for passengers to deplane…basically all the hassles which add up that it’s not even worth to fly a short distance. And for the most part, you can’t even use WiFi or any electronic device until you reach cruising altitude, which in contrast to a train, you can get right onto work as soon as you reach your seat. Air travel is meant to carry large amount of passengers across long transcontinental distances like LAX to JFK or across oceans like LAX to Tokyo-Narita or London-Heathrow. Handling large passengers over shorter distances, you need high speed rail. Face it, the airlines aren’t going to use their precious 777s or other widebody jets just to shuttle passengers between LAX and SFO when those can be used for lucrative long haul international destination routes.